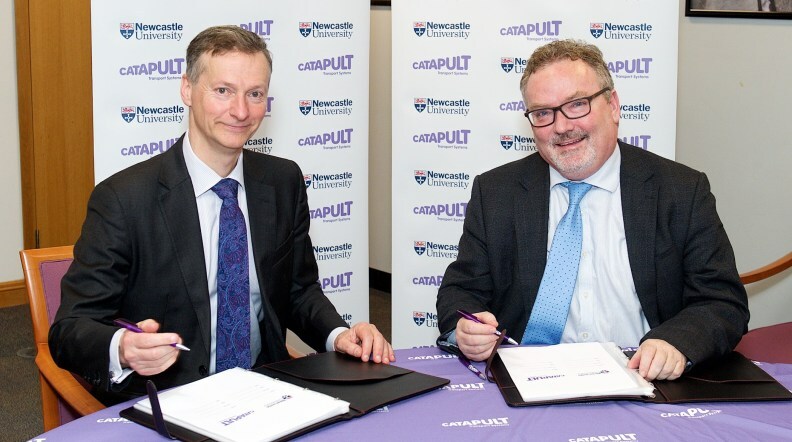 Newcastle University and the Transport Systems Catapult have signed a Deep Academic Alliance agreement which will see the two organisations work together on a number of global challenges relating to transport and the urban environment. The three-year strategic collaboration is part of a Transport Systems Catapult programme that is designed to help universities more closely align their transport-related research with commercial opportunities and the needs of industry and government. The alliance with Newcastle University will focus in particular on the work carried out by the university’s National Innovation Centre for Ageing, its new National Innovation Centre for Data and the Urban Observatory. “This is a really exciting strategic alliance with the TSC. Our complimentary skills have led us to recognise that together our organisations can tackle some of the challenges that we have in transport at the moment. We are on the cusp of a real transformation in transport with the emergence of automation, electromobility and new business models all underpinned by digital connectivity. This means for the first time we can begin to harness the potential opportunities of considering transport as a whole system and not a set of loosely connected modes – providing we can understand the complexities of this through systems thinking and a range of skills we have brought together. “I believe that, together, we are best placed to address this through our academic alliance with the TSC and our partnerships with Industry, Government and transport stakeholders alongside our National assets here in Newcastle, such as the National Innovation Centres for Data and Aging, the Centre of Energy System Integration, the urban observatory and our UKCRIC smart transport and smart city funding. “The transport sector is facing major upheaval in terms of capacity, environmental pressures and the disruption brought about by new technologies, and the smart solutions to these challenges will rely on much more than the traditional answers of more infrastructure and more hardware. Launched in 2017, the Deep Academic Alliance programme is aimed at universities that are playing a leading role in the fast-growing Intelligent Mobility sector, which is projected to be worth £1.4 trillion a year by 2030. The agreement with Newcastle University follows on from the Deep Academic Alliances that the Transport Systems Catapult has already formed with UCL, the University of Leeds, the University of Nottingham, Cranfield University and the University of Birmingham.